Nick, a Seattle native, competed in mock trial for eight years. He co-founded the mock trial program and invitational tournament at the University of Washington. During that time, he also helped coach a high school program to five consecutive state championships and five top-ten finishes at nationals. As a college competitor, Nick won ten attorney awards, including an All-American award at the 2011 National Championship. Then in law school he won the Best Advocate award at the National Board of Trial Advocacy's Tournament of Champions. Nick also teamed up with two VaMT alums, Marcy Coburn and Ben Wallace, to place first regionally and third nationally in the 2016 TYLA competition. A few months later, he had a first-row seat (with VaMT coach Ryan Faulconer) when Ben won Baylor Law School's Top Gun tournament. Between college and law school, Nick lived in Italy on a Fulbright grant. 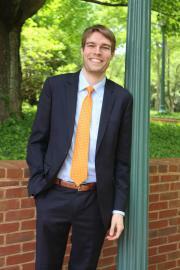 Nick graduated from Yale Law School and now clerks for a federal judge in Alexandria, VA.